In August 2014, the Petfinder blog chronicled Scooter’s “incredible” journey from a puppy mill to a loving home with Kirstin Burdett. The little French bulldog’s horizons had already begun to broaden at Tri-State Yorkie and Small Breed Rescue in Oakland City, Indiana, and his development continued in his new home. For Kristin and her boyfriend, Kevin, the year with the little French bulldog has been an incredible journey as well. 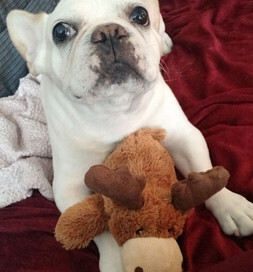 The stuffed moose perplexes Scooter. He came to them with little muscle development and couldn’t walk without his legs buckling. Now he runs along with them on their walks, savoring all the sights and sounds along the way. But, to some degree, the aftereffects of life in a puppy mill last for a dog’s lifetime because he or she has missed so many early socialization skills. Scooter, for instance, never learned to play. Though the couple bought lots of toys for him and enthusiastically encouraged him to play, he simply didn’t get it. Eventually, Kristin donated most of the toys to a shelter. “We saved one ball and a cuddly moose, just in case,” she says. “We continue to help him through the anxieties and fears that stem from his traumatic years at the puppy mill but are devoted to making each day forward happy and healthy,” she says. Former puppy mill dogs require patience and understanding. Fortunately, people like Kirstin and Kevin are willing to assist on the journey to recovery.